Hi guys, I will be sharing new face wash review today. This is the Emami Fair and Handsome Instant Fairness Face Wash. I used this face wash last month and today I am ready to share my views on it. I am sure a lot of us guys will try fairness face washes in summers, not for the fairness but at least for that sun tan removal. Do you agree guys? I like to use such face wash thinking that at least they can minimize the tan that we get while staying outdoors in sun or the heat, dust, etc that we accumulate during the day. So, let’s see this Emami Fair and Handsome Instant Fairness Face Wash review to know more about this face wash.
Price of Emami Fair and Handsome Instant Fairness Face Wash: 65 rupees for 50 g pack. 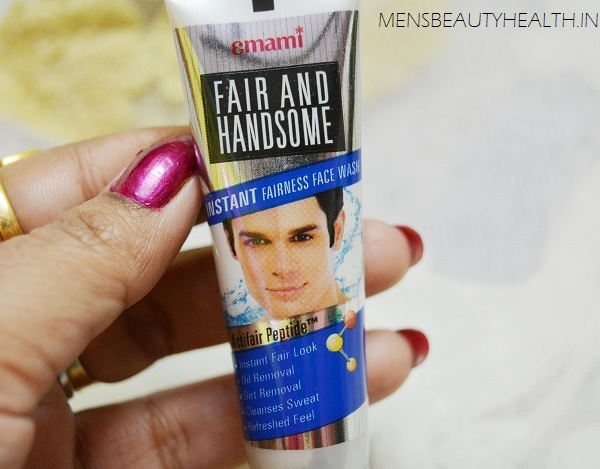 Claims: Emami Fair And Handsome Instant Fairness Face Wash has the Acti-Fair PeptideTM, that has been specially designed for men’s tough skin. This is a scientifically advanced formula with Acti-Fair Peptide which ensures that the skin gets thoroughly cleansed. This effectively removes dirt and excessive oils leaving back a squeaky clean Visibly brighter look. The turbo action skin conditioning system moisturizes the skin ensuring that it does not leave the face feeling dry and taut. The Face Wash also offers a refreshing and cooling sensation, which helps to feel energized at whatever time of the day. This is for men of all ages. This Instant Fairness Face Wash from Fair and Handsome is a powerful cleanser that washes away the dullness. The Emami fairness face wash comes in a silver colored tube that looks nice. The face wash is thick creamy in texture. It appears more like a shaving cream or foam. When I used it will produce thick foaming lather that gets rid of the dirt, dust, oils and sebum off my face. By the way guys, I take only a tiny pea sized drop. Yes, that much is sufficient for the one wash. So, after that I will splash the face with clear water and wash the face thoroughly. I use this twice a day, once in the morning during the shower and once in the evening when I come to home. Post the usage, I feel that this gives a mild cooling sensation on my face. It is always good when face wash gives cooling as this makes the skin feel fresh especially in summers. It also removes the dirt, oils etc effectively. Honestly, more than the Emami Fair and Handsome Instant Fairness face cream, I like this fairness face wash.
My face looks dull and oils after couple of hours and again. I will say the product is not to be blamed as most of the face washes can’t control the oils. The creams can still control oils as they have oil absorbing mineral clay etc. But I did not have any issues with this face wash. Moreover, the cleanser will also not make the skin get dry after the wash. It happens with a lot of face wash like you wash your face and soon after the wash the skin looks dry. Now comes the real question, does this Emami Fair and Handsome Instant Fairness Face Wash makes the skin fairer? Well, Not as such!! But as a daily use face wash for removing the skin impurities, the dirt that gets loaded on the skin throughout the day in sun, heat etc can be easily cleared off with this face wash. You can also check my review on the new face wash co created by Royal Challengers Bangalore i.e. 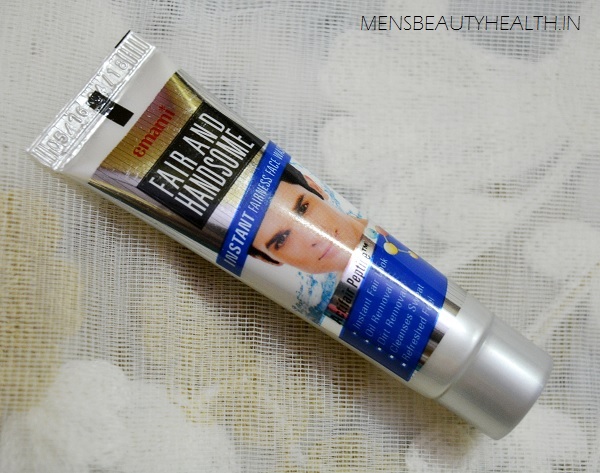 Himalaya Men Active Sports Face Wash Review. Price is affordable and not very expensive rather is good for college boys as well. Easy on pocket. Emami Fair and Handsome instant fairness face wash is a good and everyday use face wash but do not expect the fairness from it. It is god to get rid of the dust, oils etc that you get all through the day. It is effective as a regular facial cleanser and very inexpensive.